Height : c. 110’ O.D. This site, which as shown above, is of a platform nature being built on land that slopes from north to south. In the northern area the site’s interior is about 1.5 m above the surrounding field level immediately outside the single bank. However to the west and east, due to a more marked drop in slope, the difference between both levels is frequently around 3 – 4 m. Fall away to the south is less steep than in other areas. The single bank may be traced all over the site. It tends to be low and in areas its outline is more due to the sloping nature of the ground than to its height. An average height for this bank would be just below ½ m high. Its maximum width is 2 m but the average would be almost 1.5 m. Along the bank some large stones occur, possibly placed there during ploughing and clearing operations in the surrounding field. There is no evidence of a fosse about this site. The site has an internal diameter of 32 m north-south and 28 m east-west giving, as stated previously, an oval shape. To the south of the site is a stream which would have provided any necessary water if this ringfort was inhabited. With the bank so low and poorly defined one can only estimate the site of the original entrance. Because of the sloping nature of the ground I feel the southern area is the most likely. The site offers a view over a very wide area – from the Cratloe hills to the east, Shannon estuary to the south and Bunratty Castle to the west. 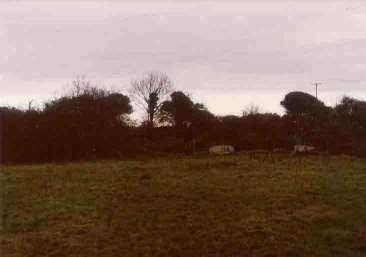 There is no known folklore associated with this ringfort.